BRIDGE 5.9 newest version : Released on November 20th, 2014. Fully Customizable Headers – Each page can have it’s own custom header with dark or light color schema, different height and background image (parallax, parallax with new zoom out effect and responsive) with title text on left or right, with subtitle on/off. Also you can choose different animation of title for each page (title text form left to right or title area holder from top to bottom). Additionaly you can choose font size, title color, title hover color too. Fully Customizable Mega Menu – Customize both standard and mobile menu, create wide or normal sub-menus at the same time, choose wide menu layout with or without icons. Add widgets to one of the columns of the wide menu and create any layout you want. Create awesome one-page web sites using anchors in the menu. Section Video Background – Add video background to sections (it fully fits it) and set different pattern image for each section. New Example Demo Sites – Left Menu, Business, Agency, Estate, Light, Urban, Fashion, Cafe, Modern, University, One Page & many more to come. You can import content from any of the example demo sites. Choose amazing design, import pages and settins with easy to use one click import demo content feature and start working on it in a minute. Bridge is not just a theme, it’s a collection of amazing examples with tons of features. Fully Customizable Title Area – Choose between responsive title image, parallax title image, zoom in/out title image and no image. Show or hide title area. Choose position of title text. Choose different type of animations: animate text, animate whole area or no animation. Choose colors, separators & much more. Apply those settings at global or page specific level. 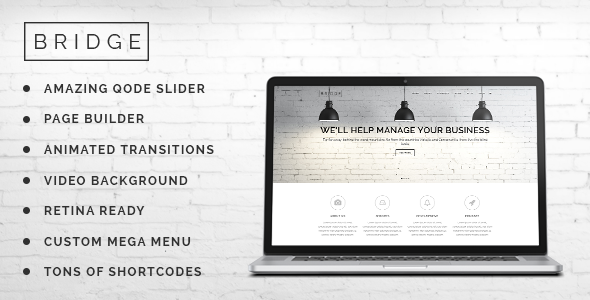 Left Menu – Choose left menu instead of top header and create beautiful portfolio web site. View example of left menu web site by clicking on Live Preview. You can make it transparent (text will have dark/light change on slide change). You can choose background image to fit whole area. All of that on global or per page level. Fullscreen Menu – Enable Fullscreen Menu which open by clicking on 3 lines icon next to menu (if enabled). Enable and see this amazing feature from our demo toolbar. Content / Section Menu – This menu is built from page rows/sections. Content menu allows creation of one page web sites. AJAX Animations ON/OFF – Choose between 4 fluid AJAX animated transitions between pages for a creative experience or turn AJAX off to create a classic website. Besides the predefined animations, create your own scenario by choosing animation type for any page individually. Visual Composer for WordPress ($25 value) – Visual Composer for WordPress will save you tons of time working on the site content. Now you’ll be able to create complex layouts within minutes! Bonus Parallax Pages – BRIDGE comes with an amazing bonus feature – easy to create Parallax pages perfect for presentations, microsites or a new homepage. WooCommerce Ready – BRIDGE comes with complete support for WooCommerce e-commerce plugin with which you can sell your products online. Qode Carousel – Full-width carousel slider plugin. Easy-To-Use Powerful Admin Interface – BRIDGE comes with very intuitive, easy to use admin interface. Add unlimited sliders and slides while you are editing page/post/portfolio, add unlimited portfolio images or videos while editing your portfolio item, add unlimited parallax section to any page. Side Menu – BRIDGE comes with an side menu widget area. There is invisible scroller implemented. Also, it is automatically closing itself after certain amount of scroll or after close button is clicked. Gravity Forms CSS – Use most popular premium forms plugin with our theme. Contact7 CSS – Use most popular free forms plugin with our theme. Fully Responsive – BRIDGE is a fully responsive WordPress theme and works perfectly on all screen sizes and mobile devices. Extremely Customizable – Unlimited colors and sizes for all elements, 500+ Google fonts and a robust backend offers a solution for a variety of business or personal uses. Flexible Layout – Use our demo layout or create your own visually different experience using our modular shortcodes and feature-rich backend. Modular Contact Page – You can set any combination between Google maps, Contact Form and regular content.